These simple seashore decorations will run you less than $5 a piece, when you make a batch of a dozen at a time, making them an affordable alternative to using fresh flowers. 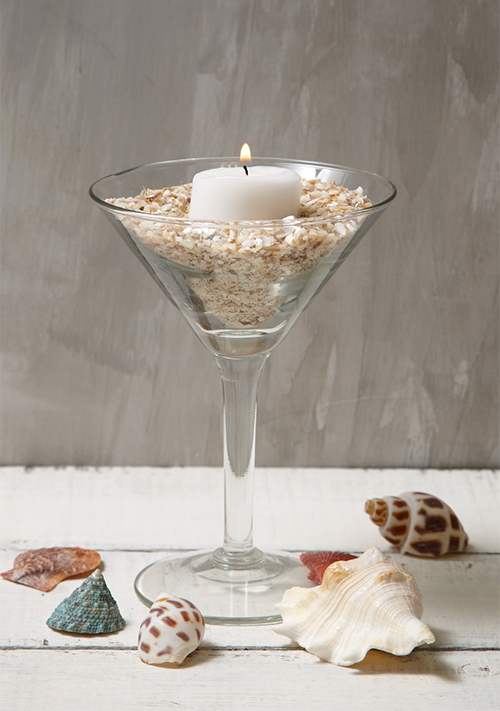 This beach themed centerpiece is crafted using only four ingredients. You’ll need a 12 pack of 6oz martini vases; 4 packs of crushed shell vase filler; a 30-pack of white votive candles; and 1 bag of seashells . This beachy table decoration provides mood lighting, and saves on space at small tables. Perhaps best of all, these are a snap to whip up, making them an easy task to delegate to willing helpers. This centerpiece can incorporate either fresh flowers, or as we used here, natural touch tulips, which are incredibly life like and available year round. We love this centerpiece idea because it’s not only easy on the wallet – each one will run you about $20 for fresh or $30 for faux – but you can also change the fruit and flower combo up to match your color palette. Think limes and green and white tulips or spider mums; oranges or tangerines and gerbera daisies; etc. 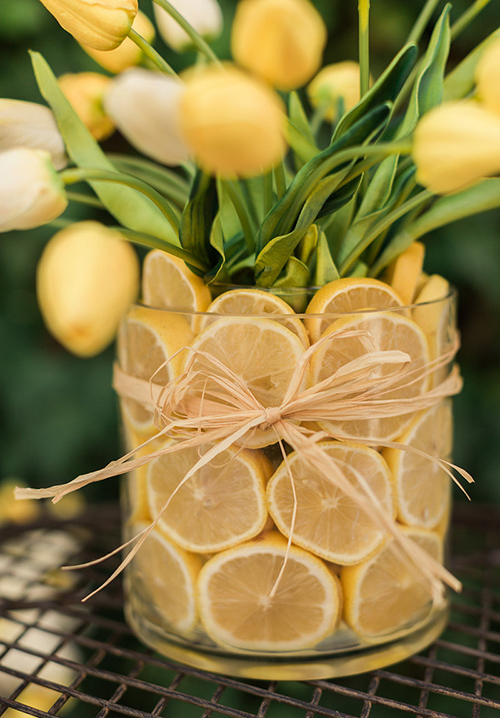 What you’ll need: a wide cylinder vase, a narrower cylinder vase, dry floral foam for faux flowers or wet floral foam for fresh flowers, lemons, tulips, and an optional bit of raffia to tie it all together. 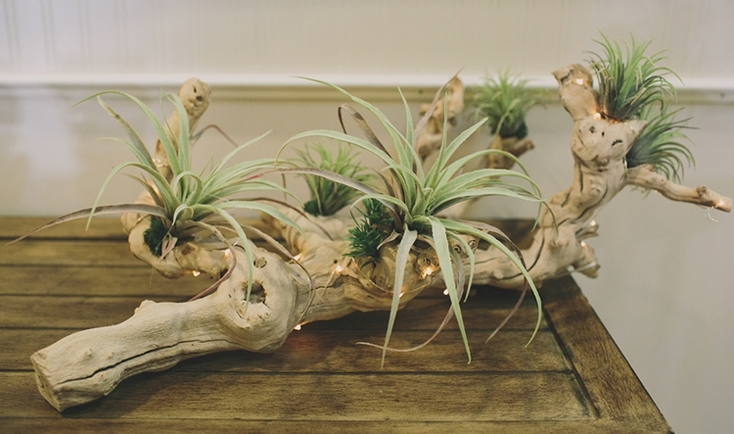 This driftwood inspired centerpiece is another of our favorite ideas for alternatives to using fresh flowers for wedding and event centerpieces. This high impact piece will run you $30-$45 depending on the size of your branch, whether you use string lights, and what kinds of plants you adhere to the branch. For our centerpiece base, we actually used a grapewood branch (although you could consider ghostwood for a slightly different look). We wrapped a string of battery operated warm white fairy lights around the branch, and glued tufts of moss and artificial tillandsiaand aloe to create the look. The benefit of this fresh flower alternative centerpiece is that you really don’t need any artistic talent at all to pull off this amazingly sophisticated look. Each floating candle centerpiece will cost between $18 and $30, depending on the floating candle bowl you choose. For a long dining table, arrange three of these in a row. 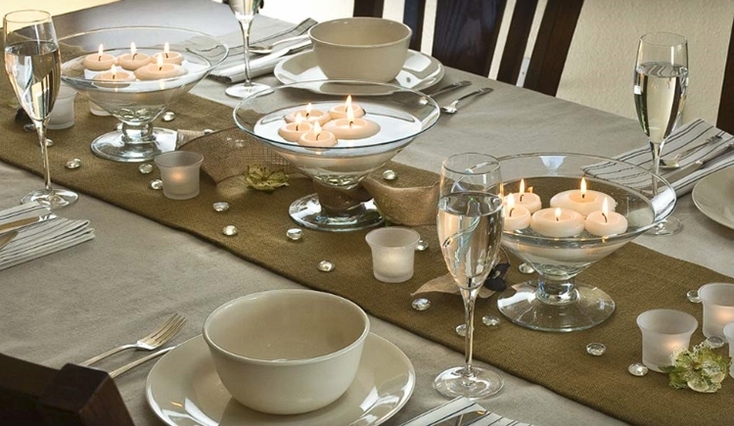 For a smaller table, you can get away with just one if you add a grouping of tea lights in small votive holders around the base of the floating candle bowl. Ingredients: floating candle bowl and floating candles. Dried flowers are making a resurgence, and need not look like Grandma’s attic (with all due respect to Grandma). A pretty pastel arrangement of drieds can coordinate with a range of décor styles, from relaxed country to bohemian to English garden. This centerpiece would be best suited to daytime and outdoor gatherings. 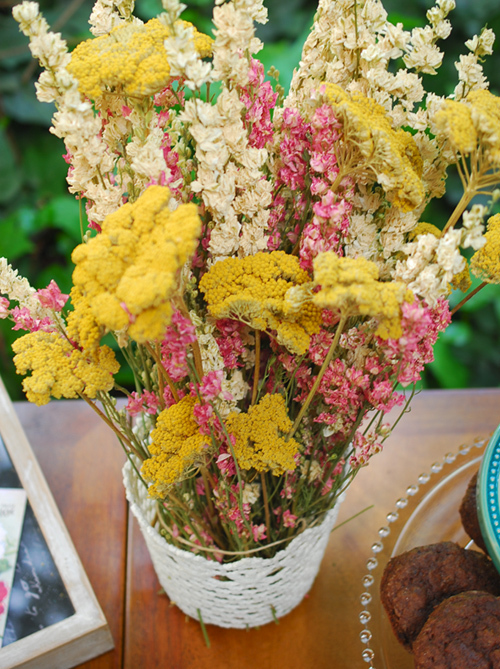 For our centerpiece below, crafted for our Tea Party Bridal Shower collection, we used a combination of yellow Yarrow and Larkspur in cream and pink all nestled in a lace basket. This small, inexpensive centerpiece is best suited for a party in the garden. 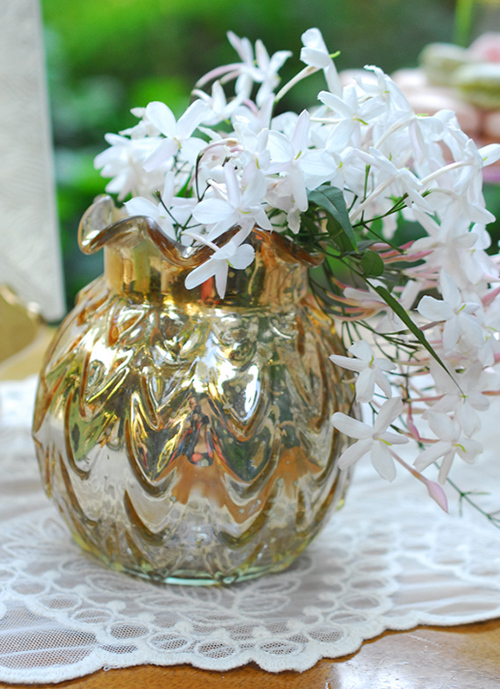 Using any garden clippings you please – we prefer anything that drapes loosely such as jasmine, ivy, bougainvillea, and wisteria – just tuck them into the Carraway Vase, a little workhorse vase that’s happy to do all the work of being charming and elegant for you. This effortless centerpiece will run you just the cost of the vase, $9.99. Even if you don’t consider yourself a fan of fake flowers, this is one of those applications that’s perfect for fake flowers. And no one’s going to reach under a burning flame into a cylinder of water to call your bluff either. This gorgeous piece is actually one of our most budget friendly centerpiece ideas, even as it yells out glamour and swank. 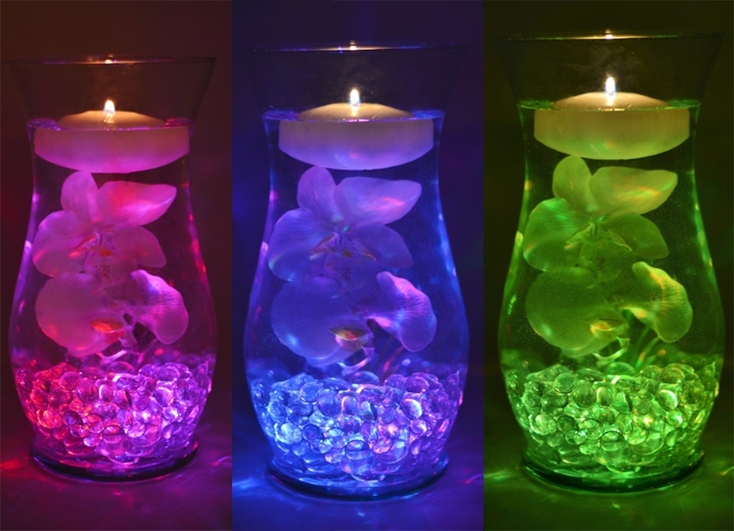 To create this piece, you’ll need a clear vase with an hourglass silhouette, a color changing submersible tealight (or, if you are set on just one color, choose a Floralyte in your color of choice), a faux orchid (a real one would suffice, if you insist), water, and a floating candle. The damage? Less than $16.